Yesterday I had lunch in Herkimer with my good friends Dottie Gaffey and Kristin Keno. These two women are frequent visitors to MRF and therefore, are acquainted with all of the residents here. Both of them are devout animal lovers whose friendship I value immensely. 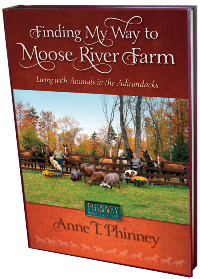 Today's excerpt from Finding My Way to Moose River Farm is from the preface for Part II. 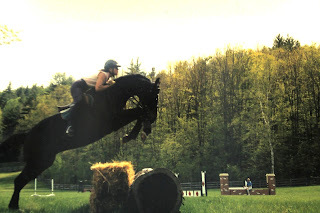 Join me as I gallop my 23 year old trusted and true partner, Zambezi for an exhilarating workout through our neighboring property, Adirondack Woodcraft Camp. Zambi and I continue our gallop into camp passed the dining hall, basketball court and soccer field. The scenery changes from dark woods to open fields and back to woods again. Zambi doesn’t seem to notice the shadows that wave with the potential to spook a horse. After all, this is my trusted and true partner who exudes confidence therefore, elevating mine. It is the essential ingredient when riding horses safely, whether the rider is participating in her first lesson or the Rolex Four Star Three-Day Event in Kentucky. She must trust her horse and vice versa. Zambi and I press onward. He has to adjust his frame to maintain balance as we go down a small hill that appears on the trail. I stay out of his way. My job is to monitor our speed. Zambi is so focused on the trail that he only slightly startles when a deer suddenly crashes through the woods flagging a warning with her white tail to three other deer following behind her. My heart skips a beat at the potential disaster that might have occurred had I been riding some of my other horses. Dwelling stops when I remind myself that I would never even consider this activity on those horses. Zambi and I continue our steady pace. Eventually, we approach one of the kettle lakes, (another remnant gouged out by the receding glacier), at camp. The shimmering water distracts Zambi for a split second before we enter another wooded section of the trail created by a stand of tall Hemlock trees. We gallop for one more minute before I am forced to pull him up at the camp road. We are both breathing heavily from our effort. My thigh muscles burn from supporting my weight in two-point position for so long. I reach down to stroke and pat his neck. I release the short contact of the reins, allowing him to walk ‘on the buckle’ across the road and into another section of wooded trail. Walking allows us to catch our breath and rest before we take off again. My mind begins to wonder about the enormous gratitude that mankind owes to horses. They have provided and sacrificed so much over many thousands of years only to be replaced rather quickly in the last century by motorized technology. Did the soldiers of the Civil War and World War I ever have a chance to bask in their relationships with the horses who served them? Or were the horrors witnessed during wartime just too traumatic and numbing, thus preventing them from connecting with their horses emotionally. This is not a criticism. I only question if there had been emotional connections, would a soldier have derived some degree of comfort from his horse? At the end of World War I, tens of thousands of war horses were slaughtered, to provide much needed protein for nations all over Europe ravaged by and recovering from a devastating war. This is just one more example of the gift God has provided for mankind in the horse. Perhaps I am most thankful for the fact that I live in an era when horses owe humans nothing and horse ownership is a privilege rather than a necessity. It takes hard work and a huge financial commitment to keep horses in my life. Although what Zambi and the other horses give back to me is difficult to articulate, it is priceless and worth every bit of the effort. That means it is just about the half-way point of vacation, but still many more days to enjoy at home. Yesterday I received an interesting phone call from my neighbor who is visiting her camp, (we affectionately call Ohio), across the way from us on West Pond. She and her family live in Ohio where they care for 4 horses of their own. Her request might only make sense to horsy readers of this blog. De wanted to come and clean stalls for me with one clear motive; to show her husband that they needed to purchase a new bed...at home...in Ohio. Allow me to connect the dots. De has been suffering from back pain lately, yet she found instant relief once having spent a couple of nights on her 'camp' bed. She simply needed to rule out, (which she did), that barn chores were the source of her pain, pointing an all conclusive finger at the bed she sleeps in at home. Thanks to the MRF barn chores, Bryan and De will hopefully, be getting a new bed! 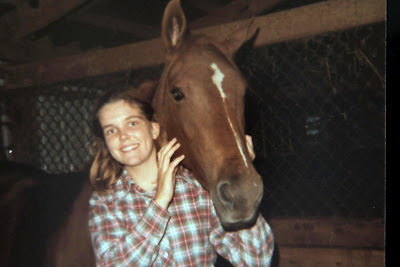 Today's excerpt from Finding My Way to Moose River Farm is about my first horse, Promise. Many of you will remember her significance in my life and how finding her brought great comfort to my heart after ten years of aching for a horse. Late in the afternoon when the horse trailer finally wobbled and squeaked down the gravel driveway it occurred to me that all the turmoil of the past summer was finally coming to a peaceful end. As the horse of my dreams stepped off the trailer and into my life, I spoke her name under my breath for the first time. My horse. My Summer’s Promise. The next day my father returned home, exhausted from his two week, (business), trip to Houston. Although a whole roll of film had recorded the arrival of my new horse, the digital age was still decades away, preventing me from sharing pictures with my father upon his return. Instead, he planned to stop at the barn the following day after his golf outing. I tried to describe what Promise looked like in case I had not arrived at the barn yet to introduce them. When he arrived home from golf the next day, he wasn’t sure that the horse turned out in the paddock was ours. There didn’t seem to be anybody around the barn who could set him straight so he had to wait until he could describe the horse he had seen to me. “There was a brown horse, all alone and eating grass in front of the barn,” he described. His words made me beam with pride for my horse,... my beautiful horse. Enjoying another easy morning at MRF! The horses and goats had spring shots yesterday. Unfortunately, Joshua had a bit of a belly ache or colic last night as a reaction to his. 10 cc's of Banamine and a good night's rest has perked him up this morning and all is well in the barn once again. 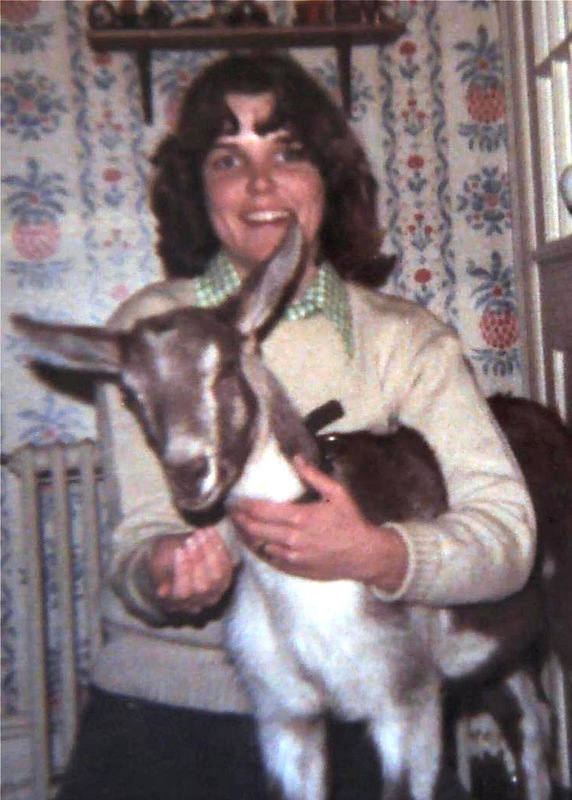 Today's excerpt from Finding My Way to Moose River Farm is a humorous story about a goat. Pierre was the resident goat at a barn that I boarded my horse, Promise, in when I was seventeen. His goatie antics weren't always appreciated by the other boarders, understandably. My best horsy friend, Lori Alosi, (who just visited us at MRF with her husband Randy, two weekends ago), and I had many great adventures together as kids. This....however, wasn't necessarily one of them. In addition to the five horses, there was a large wether, or neutered male goat left behind by the fleeing trainer and his girlfriend. Pierre became my best friend. Unfortunately, his goatiness was not appreciated by anyone else at the barn. Where horses are friendly and follow your lead, waiting to be told what to do, goats are dictators who behave based on their own needs, rarely considering others in the decisions they make. But they are full of fun and I have always been partial to those characteristics that make a goat, a goat. Pierre realized that I understood goats. He followed me frequently out into the cornfields on foot or behind Promise as I rode. I made an effort everyday to spend quality time with him, allowing him to roam freely around the barn and property while I rode or worked with Promise. Of course he urinated and dispensed an endless trail of ‘nanny raisins’ all over the barn floor usually just after it had been swept. He stood on top of tack boxes where the boarders kept their horse supplies, and if the spirit moved him, peed a huge puddle on top. It’s not surprising that he was the least favorite animal on the farm. One day I convinced Lori, now with her own driver’s license, to take him with us in her car to McDonalds where we planned to pick up lunch. Reluctantly, she agreed, (her tack box was a frequent victim). Pierre seemed pleased with her decision to join us for the ride and willingly jumped into the backseat of Lori’s old station wagon. The minute the window was put down a bit, Pierre, stuck his head out and enjoyed the breeze that blew his ears straight back. “Blah, blah, blaaaah,” he bleated to every passing motorist. Our plan was to use the McDonald’s drive-thru so we didn’t have to leave Pierre alone in the car. Of course the reaction from the employee was exactly what we had hoped for. She called all of her colleagues to come and have a look at the unusual customer in the drive-thru window. They gave Pierre a complimentary apple pie which he devoured eagerly. Next he tried to join Lori in the driver’s seat to see if any more apple pies were forthcoming. She held her temper while she shoved him back into his seat. Then she gave me the ‘why did we bring him with us’ face. Back to the barn we drove, less than two miles away. Of course just as Lori signaled a right turn into the barn driveway, Pierre felt an urge and began to pee all over the backseat. If you know anything about goats it is that they urinate and immediately follow this elimination by dispensing fifty little ‘raisins’ as well. This may have been the first time that Lori was truly mad at me and rightly so. Thirty years later we laugh about it, but it was no laughing matter each time she pointed out the lingering stench that plagued that old station wagon for the rest of its existence. Pierre visiting in my family's kitchen! This morning feels a whole lot more like March, with dark clouds and evidence of rain that turned briefly to snow in the night. The weather will be a good excuse to attend to spring cleaning chores in the barn. First, however, our vet, Dr. Stacey Kenyon will be coming to administer spring shots and other routine maintenance for the horses and goats. Fiona has settled after a long, five day heat! She is exhausted from her lack of sleep and is snoozing comfortably in her bed at the moment. Hallelujah! 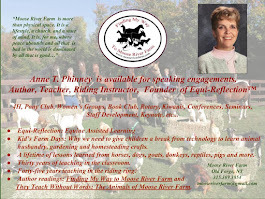 I hope you will enjoy the following excerpt from Finding My Way to Moose River Farm. Although horses are a large part of my life, past and present, the book is filled with characters from other species including ducks, chickens, a deer, a Canada goose, and many faithful dogs. For two of my college summers, I had the great pleasure of working for Olympic rider, (and now race horse trainer), Michael Matz when he trained out of Erdenheim Farm in Flourtown, PA. One summer there was an epidemic of baby birds who died after falling from the insulated roof of the indoor arena where their parents had built nests. Sadly, we cleaned up the tiny, fragile remains lying in the sand on a daily basis. 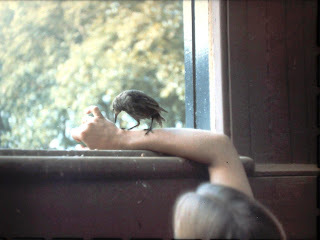 One day, however, wobbling among the broken bodies was a baby starling. Raising Peeper is an experience I will never forget. In this excerpt, he has mastered flight and is under the assumption that everybody shares his enthusiasm for this skill! Enjoy! With his newly discovered flying skills, Peeper’s care became a whole lot easier. The farm had no cats and was far enough away from the road that I did not worry about mishaps. When he wasn’t resting on his bucket, he flew in and out of the barn through the windows and doors. His distinctive raspy voice was easy to locate in the large sycamore trees that kept the barn cool under their shady leaves. He was now free to investigate his own dietary needs. I was never sure what he found to eat around the farm, but I limited his hamburger meals to only twice a day. Starlings are opportunists and since Peeper had no fear of humans, he assumed that everybody enjoyed his company. The Jumper barn grooms were beginning to warm up to him now that he confidently landed on the shoulder of anybody who called to him. But Peeper didn’t always wait for an invitation. Dropping the pitchfork I was using to clean stalls, I immediately ran out to the field. There sitting on top of the brim of Michael’s ever present blue baseball cap was Peeper. He was taking a rest from flight practice and seemed to enjoy the bouncy lift that Chef was providing for him. Michael was smiling as he leaned down over Chef’s shoulder so that I could pluck Peeper’s stubborn claws from the hat. My favorite memory of Peeper that summer was the walk over from the Dressage barn to the Jumper barn every morning to turn Grande out. While leading the big horse from his left side, Peeper would follow in a sweeping motion stopping briefly to sit on a fence post then swooping to catch up with us. In addition Eric, (my Dachshund at the time), trotted along at my left always keeping a safe distance from Grande’s feet. With the early morning mist lifting off of the green grass, our little procession must have looked like a scene from a Disney movie. The best part about vacation is that I don't have to leave home for days on end. As long as there is milk and a green vegetable in the refrigerator there is no need to even warm up the car. This morning it is 12 degrees; a huge change from the unseasonably mild weather we have experienced this March. Still, there is no place I would rather be. The horses have tried desperately to shed their coats in the extended warm weather. This morning they all appear to be covered in velvet. What little hair that remains is trying to conserve body heat. Fiona, our pot belly pig, is at the end of a very long heat cycle. For four days she has been out of sorts and unable to sleep for any length of time. She has accompanied the dogs, goats, Rod and me on our daily walks which we have purposely extended in an effort to wear her out. After a brief nap, however, she seems ready for another marathon. Although, our patience is thin after four days of manning the door, (all day and all night), so that she can go out and come in, go out and come in..., she is still our favorite pig! Finding My Way to Moose River Farm is separated into three parts. Part I chronicles my childhood through college graduation where my adult life with animals dangled in front of me while growing up, impatiently, toward it. Part II spans the next 18 years as they unfolded from two prophetic decisions, (based on my love of horses), that sent me to the Adirondacks where I met Rod and began to accumulate the menagerie that I dreamed of in my youth. In Part III, Rod and I leave our beloved Lakeview Farm behind to build and begin the next phase of life at Moose River Farm, a spacious jewel nestled in the Adirondack wilderness. The following is an excerpt from Part III of Finding My Way to Moose River Farm. Enjoy! Moose River Farm is more than physical space. It is also a lifestyle, a church, and a state of mind. It is, for me, where peace abounds and all that is bad in the world is dominated by all that is good. There is a rhythm here that never stops, although it does change throughout the year. In the winter that rhythm is muffled by a blanket of deep snow that encourages all of us to slow down and rejuvenate our batteries. With the coming of spring the rhythm picks up tempo and finds accompaniment in the beautiful birdsong that welcomes new life all around the farm. In the summer, the rhythm is established through the buzzing insects, garden bounty, and gentle breezes that rustle through the trees. Come fall, the rhythm is overwhelmed by the brief and dramatic crescendo of color that accentuates every view on the farm. After the rich tones vanish, the beat softens as winter takes hold once again. Moose River Farm as viewed from Heaven! 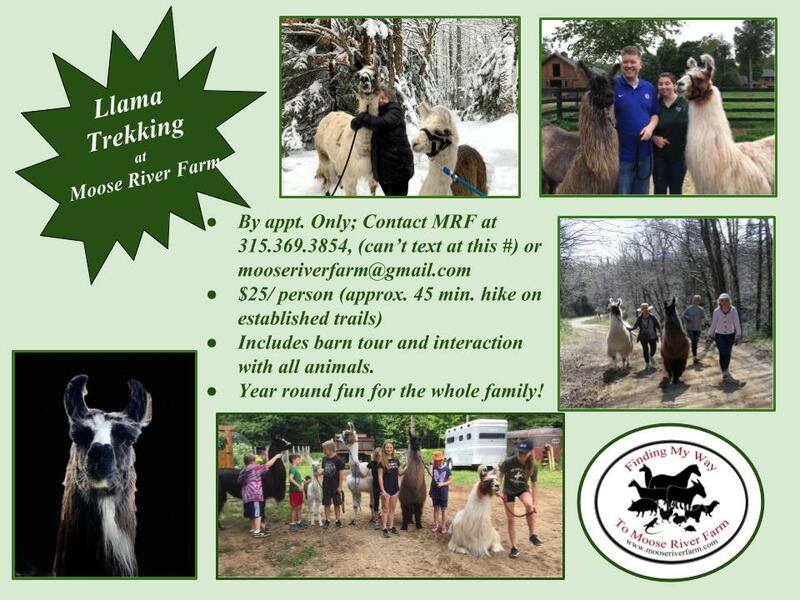 Welcome to Moose River Farm's official blog! The purpose of this blog is to acquaint readers with the residents who live here. 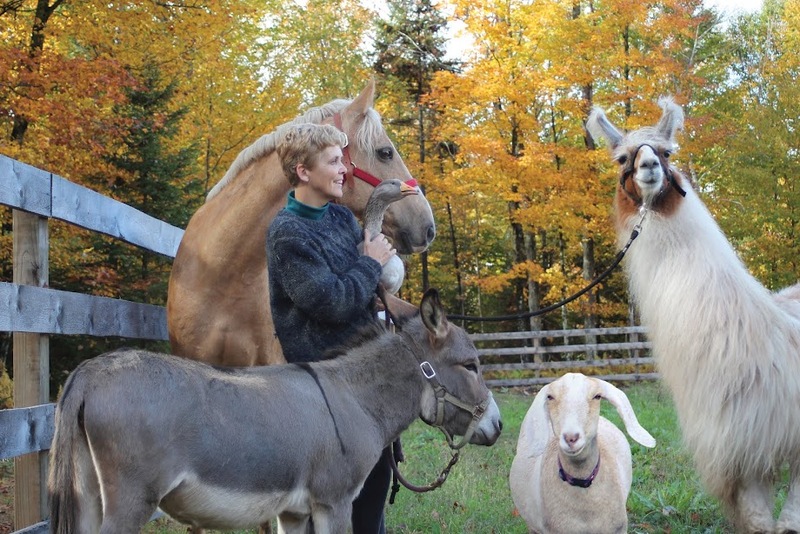 My husband Rod and I share our farm with 11 horses, 4 dogs, 3 goats, a pig and an iguana. Each of them has a story to tell and hopefully through words, pictures and videos you will laugh and cry as you get to know them all. The blog title, Finding My Way to Moose River Farm, is actually the title of a book that I have been writing for the past two years. It is the chronicle of a life, my life, shared with a variety of animals who have joined me along the way, thus helping me to pave a path from Philadelphia, PA to the Adirondacks and ultimately, to Moose River Farm. Although the book is far from completion, I do plan to share excerpts from it here as well. I hope you will share my enthusiasm for this blog and will plan to visit often. Perhaps there are special animals in your own life who you will share with me. Looking forward to this new adventure!